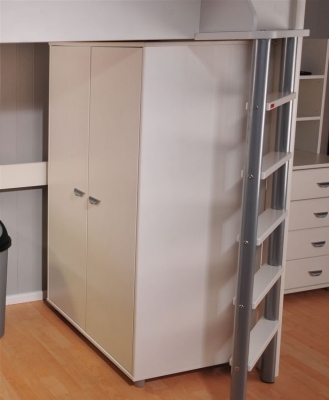 The Stompa Wardrobe 1 is available in a modern white finish with a choice of blue, lilac or white coloured tops. Featuring comfy easy grip metal handles positioned to the inner centre of the adjustable hinged wardrobe doors. For storage the children's Stompa short wardrobe 1 has a full width hanging rail and large height adjustable bottom shelf. This stunning Stompa wardrobe is designed to match the Casa, Rondo and Solo bedroom furniture ranges. Free UK Mainland Delivery 2 to 4 Weeks.